David Gibson attacked Douglas Walker at Montrose Health Centre while he was a patient. David Gibson: He severely injured the doctor. A man who slashed his doctor at a health centre has been jailed for almost four years. 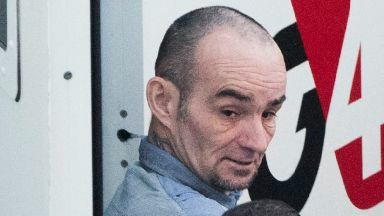 David Gibson attacked Douglas Walker at Montrose Health Centre while he was with a patient and told him: "Remember me? Not so funny now." Gibson had an appointment with Dr Walker that morning and had appeared upset. The 42-year-old admitted brandishing a knife, severely injuring the doctor, and repeatedly striking the his door with a knife. Dundee Sheriff Court was told Gibson had attempted to speak to his mental health support team but was told no one was available. The court heard he left in an "agitated manner" and then phoned the centre saying he had four knives and would stab someone in order to get help. Depute fiscal Stewart Duncan told the court Gibson returned to the surgery at 4.45pm. "The accused entered the front door of the locus holding a knife and stripped off his t-shirt and jacket. "People were fleeing and running out of the building." Gibson attacked Dr Walker and the doctor pushed him away with his feet. Mr Duncan said: "Gibson attacked him again, lunging at him with the knife, which sliced the webbing between his thumb and forefinger." The doctor was able to grab Gibson and the knife and wrestle him out of the room before locking the door. Gibson then charged towards members of the public in the reception before repeatedly stabbing Dr Walker's door. Ross Donnelly, defending, said: "He is repentant for what he did and he understands the effect this may have had on people in the surgery." Sheriff Alastair Carmichael told Gibson: "A medical centre is a place where people go for medical treatment and reassurance and people there can be vulnerable. "The circumstances here lead me to conclude there is no alternative but custody."